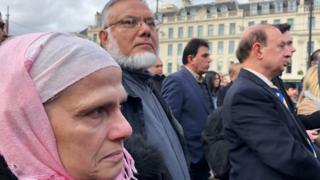 A vigil has been held in the centre of Glasgow, remembering those who died in the massacre at mosques in New Zealand. Fifty people died and dozens more were injured in the shootings at two mosques in Christchurch on 15 March. A lone gunman is thought to have attacked the Al Noor mosque and the Linwood Islamic centre. The Scottish event brought together faith groups and speakers from a number of political parties. "That attack didn't happen in a vacuum," Mr Yousaf said. "The political discourse, the media discourse on Islam, on Muslims, on minorities is adding a gallon of petrol on a fire that does not need to be there. "So when Boris Johnson says that women in niqab look like bankrobbers, or letterboxes - Boris Johnson, shame on you because you're the one that's adding fuel to the fire. "When politicians talk about swarms of immigrants, talk about villages and towns being swamped by immigrants, then you are part of the problem." Following the event, Glasgow Labour MSP Anas Sarwar said it was important for people of different beliefs to send a message of solidarity to the people of New Zealand. He said: "(We are) imploring people to please come together and work together to challenge all forms of prejudice and hate. "We can see right around the world that prejudice and hate are on the rise. "There are people who want to divide our communities, who want to create 'the other' and create an us-versus-them society. "We've got to challenge that and confront that."